© Anwar Amro, AFP | Lebanese Kurds hold a placard of Turkish President Recep Tayyip Erdogan at a protest in Beirut in Jan. 2018. While the fighting between the Turkish and Syrian Kurdish camps rages in northern Syria, a war of words and videos online is being waged for hearts and minds. The war between the Turkish military and Syrian Kurdish fighters in northern Syria is being fought with ferocity on all fronts. In the hills and valleys of Afrin, the Turkish military and their rebel allies are locked in a deadly fight against a US-supported alliance of Syrian Kurdish and Arab fighters. Away from the gunfire and bombardments of the frontline though, both sides are waging a no-holds-barred propaganda war to win hearts and minds. “Propaganda machines are running full-speed, 24/7. On both sides, there is a war of words and a war of numbers,” said FRANCE 24’s Mayssa Awad, reporting from northern Syria. For starters, casualty figures released by Turkey and the mainly Kurdish SDF (Syrian Democratic Forces) have varied over the past few days. On Saturday, the deadliest day for the Turkish side in Syria, Ankara said 11 Turkish troops were killed in combat operations. The SDF however said 23 pro-Turkish fighters were killed, according to Awad. “Each side is trying to minimise its losses and accusing the other side of being terrorists,” she explained. “Daesh” – the Arabic pejorative term for the Islamic State (IS) group – is a widely employed arsenal in this war of words, with both sides accusing the other of using jihadist fighters. On the other side, pro-Kurdish sites have been awash with videos of Turkish-allied fighters — many sporting free-flowing beards without mustaches in the hardline Salafist style — committing atrocities in the Afrin region to cries of “Takfir!” [the Arabic denunciation of an apostate] followed by the ubiquitous, “Allah-u akbar” [God is great]. A video clip circulating on Twitter last week showed Ankara-backed fighters preparing to go into battle in Afrin and vowing to “liberate” villages in the area. “With Allah’s permission and assistance, we will keep fighting you, oh infidels, oh enemies of Allah,” says a fighter using the slogan commonly used by al Qaeda and the IS group. “These are the people “liberating” #Afrin,” tweeted Mutlu Civiroglu, a prominent Syrian and Kurdish affairs analyst. Turkish forces have allied with more than 10,000 Free Syrian Army (FSA) fighters on the ground, sparking concerns over the number of jihadists participating in the latest Turkish offensive into Syria, codenamed Operation Olive Branch. Seven years into the Syrian civil war, the picture and profile of rebel fighters in the conflict is murky, with many militants switching between groups, and battalions forging ever-changing alliances, often with new names. Turkey has declined to provide details of its FSA allies and there are concerns in secular opposition circles that Ankara’s links to radical jihadist groups could have security consequences as Operation Olive Branch widens its combat operations. Analysts also warn that Ankara could lose control of jihadist fighters across Turkey’s 900 kilometre border with Syria after the fighting subsides. The FSA, for its part, has faced an uphill damage-control battle decrying abuses recorded in videos circulating online. One particularly gruesome clip sparked international outrage earlier this month, forcing the FSA to order an investigation into the incident and issue a statement vowing that the group “will not hesitate to hold accountable those who prove to be involved in this incident, if it is verified, in accordance with Shariah law and our principles”. The 15-seconds clip — which was obtained by the London-based Syrian Observatory for Human Rights by one of the fighters featured in the video — shows a group of FSA fighters mutilating the corpse of a female Kurdish fighter. The gruesome images of fighters placing their feet on the naked breast of the corpse while others call her a “female pig” as someone off-camera exclaims, “She’s beautiful, man” sparked revulsion among Kurds in northern Syria. The fighter, known by her nom de guerre, Barin Kobane, is now on the pantheon of YPG martyrs. In interviews with FRANCE 24 earlier this month, many female Kurdish fighters said they would not be intimidated by the video. “Our enemies are monsters. They want to crush women and make them slaves. We’re not going to let them,” a female fighter told FRANCE 24. 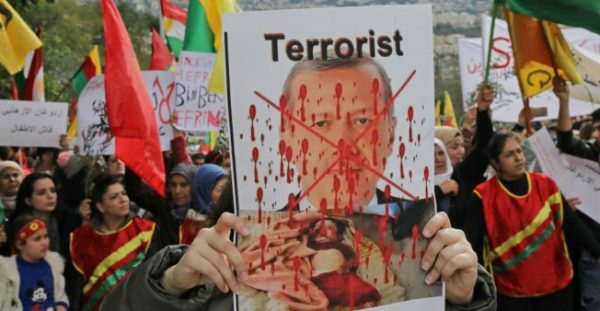 For Kurdish women in Afrin, the misogyny on display in the video, as well as the use of pejoratives such as “pig” — considered an unclean animal – are signs of a Takfiri Salafist ideology that are likely lost on international audiences. Another video features fighters in what looks like the northern Syrian countryside listening to a young jihadist singing a song of praise to the mujahideen, or religious fighters. “We resisted in Grozny, in Afghanistan and we made of Tora Bora our den,” sings the young fighter, referring to the cave complex in southern Afghanistan that housed al Qaeda leaders, including Osama bin Laden, before the 2001 US invasion. Paeans to the fallen martyrs or mujahideen are not the exclusive reserve of rebel fighters. As the toll of Turkish soldiers slain in the Syrian battlefield mounts, the Turkish government is widening a crackdown against opponents of the Afrin operation. Since Operation Olive Branch was launched January 20, nearly 600 people have been detained for opposing the offensive, according to Turkish Interior Ministry figures. These include 11 senior members of the Turkish Medical Association after the group put out a peace message declaring, “No to war, peace immediately”. Turkish authorities have repeatedly warned that they would prosecute anyone opposing, criticising or misinterpreting the military operation in Syria. But as the conflict rages on, with Turkish casualties mounting, Erdogan is resorting to propaganda pageants that are raising eyebrows even among a populace familiar with the Islamo-jingoism of the ruling AK Party. At a party event earlier this week, Erdogan appeared with three children, including a girl who looked no older than six dressed in a hijab covering her head and shoulders, said Turkish analyst Amberin Zaman in the Al-Monitor website. The children recited nationalist poems, including one by Necip Fazil Kisakurek, an anti-Semitic Turkish writer who embraced some tenets of European wartime fascism. The event ended with a young boy reciting a verse from the Koran traditionally used at funerals. “He wants to say a prayer for our martyred soldiers,” noted Erdogan with approval. The use of children for propaganda is as widely criticised as it is employed across the world. The Syrian conflict is no exception.